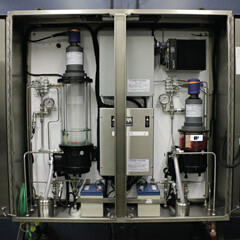 The Weir-Jones Group's new Automated Grease System is a user configurable dispensing unit capable of supplying bearing and sealing greases to submerged pumps at pressures of up to 300 Bar and down line lengths of 200 feet. These units are designed to manage dispense frequency and start / stop timing internally. AGS™ units can be customized to suit the target machine application and will maintain a continuous buffer of health and dispense data. Multiple units can be connected together, via a central lubrication supply, or they can be fed semi-automatically from a standard barrel. Typical refill intervals are one month.